Charlie Ross and James Braxton begin in Rushden, Northamptonshire, and stop off in Cambridgeshire, Bedfordshire and Buckinghamshire, before heading to an auction in St Albans. To make the biggest profit at auction, but it's no mean feat. top auctioneers James Braxton and Charlie Ross. made before seatbelts were legally required. -It's gone all over my face. Oh! It's gone over my trousers. In fact, you've got water all over you now. It's been an eventful journey so far. On the net at £200 dead. Done. Thankfully, he was saved at the last minute by Winston Churchill. Charlie, you've got some serious catching up to do! I've only got two more days to do you. -It's not easy. It's going to be hard. I'm going to grapple, I'm going to hang on to that win. -You're like Micawber, aren't you? -How much is that? Four pounds! I'll give you £2.50, my dear. You might scoff, but clearly his tight tactics ARE working. Our competitive pair began their trip in the Lincolnshire town of Boston. in the town of Cobham in Surrey. and then they'll shop their way to auction in St Alban's, Hertfordshire. -Pleasure to be driven by you. by the tradesman's entrance, by the look of it. Do I want to do a bingo? like that tight old fellow? No. I want to get stuck in. Oh, look at that canework seat! but, actually, it can't be, because it says 1948 on it! That's wonderful! Madeira - a place and also a drink. Well, it's a BIT tatty. "Madeira", do you think that came off a ship called Madeira? I don't think it's called a Madeira chair. and they were sold to the tourists who came off the steamer ships. but I see it's priceless, cos it hasn't even got a label on it! -It could be devilishly cheap. is asking you what you paid for it. What did it cost? 99p! I think it's just a fantastic thing, though. a substantial return on your capital. I'll tell you, we'll make it easy, £10. about something, it fails, but this can't fail. my opposition is going to be jealous of that. How about those nice little bottle coasters? -Got a bit of age, haven't they? -..and the copper comes shining through. -I had £40 on the pair. Are they are buyable for me? You can have them for 25. Well, now I think they'd make 25 at auction. That's my trouble. Something to think about, then. the largest town in Cambridgeshire. and boasts one of the most ancient market squares in the country. And James' first stop of the day. -Hello, Jacqueline. What a lovely place. -Oh, I'm pleased you like it. I've managed to find it. It's through that mystical archway in the market square, isn't it? Definitely. We're tucked away, aren't we? We're tucked away. collectables and memorabilia on offer. ..cos I think it's just one of the most fabulous materials. It's so strong, it is the sum of parts. you could easily add these. This is very much Margo and Jerry territory, isn't it? -Oh, definitely. The Good Life. Good price. I know the dealer very well. Very good price. He's very keen. Keen on prices? What has he got? 12 for the two? It'll be 12 each, I should imagine. He's got two after it. Yes, we'll do 12 for the two. -12, right, come on, put it here. See, first one in the bag! Thank you, goodbye. What's he up to now, then? about getting my hand deeper into my pocket. that I have frugally spent £12. He's going to love it. Cor, what a scamp, eh? has been thanks to Winston Churchill. Well, you have an interesting one there. Oh, blimey. Someone's given it a right bashing. It says silver, but that appears to be silver-plate to me. I think the medallion in the centre is the silver. and the dish is plated. That's a gamble lot, isn't it? A couple of people like Churchill, they could get stuck into that. would that shave them at all...? Or not? -60 for the pair of coasters. I think that's incredibly generous. I've got to keep Churchill going. -60 quid and Madeira was a tenner. Shopping made easy by Ralph! Good work, Charlie. Three lots with potential in your first shop. James, meanwhile, has made his way to Bedford. the focus of a brutal crackdown on religious freedom. there was one man who stood fast in his beliefs - John Bunyan. that would rival the Bible's popularity around the world. I come seeking Bunyan! Tell me all about him. and his family had lived there for generations. and went to fight for Oliver Cromwell and Parliament. The young Bunyan had entered the English Civil War. and the establishment of a republic, led by Oliver Cromwell. and a time of great religious discovery for Bunyan. When did the light shine for him? "Wilt thou have thy sin and go to hell? "Or wilt thou leave thy sin and go to heaven?" From that moment on, Bunyan's life was changed for ever. his nonconformist message around the country with great success. and religious freedom came to an end. having people ordained rather than just anyone being allowed to preach. -what happened to dear old Bunyan then? -Well, he ignored it, basically. He was becoming very famous, very popular. when, actually, only two would have been necessary. and was imprisoned in the county jail in November 1660. Bunyan ended up being put in prison, basically, indefinitely. He ended up spending 12 years. So we see Bunyan here writing. Did he start writing in jail? Certainly his spiritual autobiography, Grace Abounding. We know he probably wrote that during his 12 years. -and started sketching that out. -And this was his big book. and that has gone on to be so incredibly well regarded around the world. thanks to a law of religious clemency introduced by the new monarch, Charles II. a simple tale of good versus evil. It tells the story of a pilgrimage through this world to the afterlife. He did a sort of synopsis of the Bible. that anyone... it doesn't even have to be a Christian message. It is the simple, how to live a good life. and the Bible in a much simpler way than getting them to read the Bible. -and dialects that it's been translated into. than there were the Bible in working people's houses. at the age of 59.
from its first release over 300 years ago to the present day. what will Charlie uncover at Hunters Antiques? -We've met before, haven't we? -We have, a little while ago. You've done some things since I was last here! Bit of a change. Everything's expanded. Nearly broke something there, Nick. -It came from a primary school. -The kids could never get over it, they were never tall enough! Probably weighs a tonne. It's got some weight. If I proved I could jump over it, could I have it? I think my insurance man would pass out... I dare say! I think my trousers would split, probably. Feast my eyes on the cabinet. There's loads of it. Now that is quirky and original, Nick. Or rather a novelty pipe in the shape of a gun. Hang on one second, I'll get it out for you. I think so, I'm not entirely sure, but I think it is. to sell that for ten quid or something, wouldn't he? I think that's probably the best part of 50 years old. I don't suppose that could be insultingly cheap, could it? Like a fiver or something? -Yeah, I could do that. -As they say, there's not much downside. You can't lose a lot on it, no. -That's not going to make you the richest man. ..in Wellingborough, but there we go. but novelty items often do well at auction, so it could be a canny buy. Yes, but you, by nature, are an extremely generous man. -It must go against the grain to shop like this. Well, hold on, hold on. Let's put this into some proportion. was priced at 12 and you had the temerity to pay £8 for it. -And it went on to make? You weren't exactly peeling off the notes then, were you? First stop of the day is Woburn in Bedfordshire. -This is my county. Well, yes. -just down the road in Woburn. Woburn has been burnt down and rebuilt three times. which was rebuilt in the Georgian style that remains today. James has some serious shopping to do. -Hello, Alvin. Very nice to meet you. -Good. So this is your emporium? Shop! It's quite a big shop, isn't it? You'd better get on with it, then. He's on to more bamboo, look. But do people want that in a modern interior? That's the difficulty. Quite fun if you did have a nice conservatory. Something like 28? Could that buy it? Don't look at the label, no clues. No. No. OK, that's all right. £40 you can have it for. -and I might do a collective. I quite like this little lot. and you've got six there, which is really unusual. They fit together in the cases there. Worth a closer look, I guess. I suppose you'd call it a nest, wouldn't you? This is...this is...very fine maker, Hukin and Heath. And there's a leather case, which is a little bit tired. -They're quite cheap, I think. Anything else before you go in for the deal, James? So games are always quite fun. -That's quite big, isn't it? They are normally quite a bit smaller than that. So that's... This is a solitaire board. -It's quite nice having the big marbles, isn't it? They are obviously all original. I guess this is best part of 100 years old. -It looks 1920s, doesn't it? Always good to introduce into a home a dusting nightmare, isn't it? -I think that's rather fun. Could the lot be bought for, say, 95? Erm... They are all priced around the 40, 45 mark, aren't they? I'm looking for a discount! You're not a million miles away. Ooh! Is there a little chink of hope there? -105 and you've got it. -105 and you've got it? I got the feeling it's 105, isn't it? -It is. Thank you, James. You're slightly frightening, I was going to chance me arm. Well, some serious shopping done there with three lots bought. Charlie, meanwhile, has made his way to Woburn Abbey. of the opulent lifestyle of the aristocracy. whose tragic last flight remains a mystery. To tell Charlie more is curator Chris Gravett. How did she get associated with the family? She married when she met her future husband in India. He was an ADC in the Army. She'd gone out because her father was an Archdeacon over in India. dies and suddenly they become Duke and Duchess. She was never expecting to be Duchess, then? which she did at the cottage hospital she established near the Abbey. -she trained as a nurse herself. the Duke agreed to use Woburn as a military hospital for soldiers. -What a wonderful place to be recuperating! -When the war ended, she still worked in the hospital. In 1919, she was trained enough to do minor surgery. -So she became a surgeon? -She became a minor surgeon, yes. a hearing impairment she'd developed after a bout of typhoid. that she discovered a new passion - flying. It was a pastime reserved only for the very rich. And employed a pilot to take her up. so much so that in 1928, they had a go at the record to India. flying to India and back in eight days with many fuel stops. in just 20 days. Wow! They had a few hairy moments. and they were being gassed. The pilots were fighting to keep awake. -and they'd have all been dead. Mary became an accomplished pilot. and needed to clock more hours to renew her pilot's licence. and headed towards the fenlands, inland from the North Sea. the Duke was getting worried because she hadn't come back. And, to this day, we're not sure what happened. There are two theories as to what actually happened. before running out of fuel and crashing. But there is an even more tragic possibility. she knew that... Because of the funding. She was so deaf she couldn't communicate with her husband. -"Well, let's go out on a high." the first at Yarmouth and then around the vicinity. -From the plane and we have those here. So it's still a mystery. Thank you very much indeed, Chris. and to learn about that remarkable woman. it would seem, to a rather large family of Canada geese. James has one last shop of the day. -Charming weather out there, isn't it? -It's lovely, isn't it? Hello. Hello, nice to meet you, Mags. Fenny Antiques is full of the combined treasures of 40 dealers. Ooh! I might have a look up there. and they're very often these, sort of, light colours. What do you look for when you look at a carpet? You look for holes, don't you. And Mr Moth! Any moths? But rather nice. You know, somebody has made this. It's probably made by machine now. But, you know, there is evidence of craft here. Look at the back of it. Can Mags do an even better deal? Fortunately it hasn't got a hole - I've checked it all over for a hole. Hasn't got the moth, which I'm pleased about. I wouldn't mind buying it for a tenner, if that's possible? OK, I'll go a tenner. both our boys are bought up. ..and the aubusson wool carpet. Charlie spent less, shelling out £75 on four lots. and the vintage novelty pipe. from the last auction to this auction. So what do they think of each other's lots? God, where do I start? Talk about the Battle of the Bamboo! and he buys it for a remarkable £10. I think he's got a winner there. And a game of solitaire, £25. I've seen them for ten in the shops! That pipe! Now there's no excuse for that pipe. but at the end of the day, it's a pipe and it's a fiver. As for your rug at a tenner? towards auction in St Albans, Hertfordshire. to world-famous physicist Stephen Hawking. Charlie, great shame you didn't go all-in on this one, wasn't it? Oh, I really wish I'd spent all my money! to have the sale outside today. Our boys will battle it out at Hertfordshire Auctioneers. What does auctioneer Chris Small make of our experts' lots? There's quite an eclectic mix of items. I quite like the pipe revolver. What it's worth and what it will make, I don't know. I think if we get a tenner for those, we'll be doing well. it does have its original box. maybe the most money today. We've got bidders in the room and online. Get comfy, chaps, the games are about to begin. -Back in your favourite position. -Front row of the stalls. -Front row, I'm looking forward to this. with the late Victorian bamboo stand and planter. -15, you've got 15, have you? 15, I've got. £15 I've got. To my right at £15 I've got now. It's on the net at 15. And 20, Steve at 20. At 20, I've got now, £20 I've got. plant stand and brass pot there. All done with that one at £20? You're coming back to join me, James. You're coming back! Much to Charlie's delight, that's a disappointing start for James. Will his pair of 1970s bamboo tables do a bit better? Give me a tenner, who's in? -I've got 5, it's a bid, it's a bid! -15, got now at 18. 18 and 20, bid 20. You're riding it now, James. Amazing. £22 I am bid for these. Any more now at £22? Charlie, m'dear, it's your Madeira chair. -Ten I've got, thank you, at ten. 12 I've got now. At 12, you're out at £12. To my left is the bid at £12, I've got. It's from Madeira, my dear! £12 is bid to my left, at £12 for it. Is there any more now? It's got to go, then. £12, oh, dear, oh, dear, oh, dear! It's like a bullet through the heart. I don't think he's taking it very well. -So you're not pleased with the 12? -Desperately. I feel a moistening of the eye. Come on, chaps, dry those eyes. Your rosewood mirror that failed to sell at the last auction is up next. Start me at 20, who's there? 20, 30 I'm bid. Goodness me. Oh, come on, folks - lovely thing. -Thank goodness for that, Charlie. 30 on the net, £30 I'm bid this one. Is there any more now? At £30 on this one. and we don't have to cart it round any more. You are smelling of roses here, I don't know what's going on. Can Charlie's luck continue with his silver-plate bottle coasters? -20, got 20 I'm bid straight in. At 20 I'm bid these, at £20 I've got. Nearly all the bidding is online, isn't it? I don't know what all these people are here for. It's the net bidder at £20. -Are you done with them? Gone! -I think the buyer will be over the moon. Someone's bagged themselves a real bargain there. Charlie's up again now with his Bakelite pipe shaped like a gun. 20, thank you, straight in. £20 I got. 20 I'm bid, it's on the net. £20 I've got. 20 and 5, 25. I've got 25 in the room, 25 I've got, lady's bid. 35, got. 35, it's in the room now. Net bidder, you're out at 35.
and something to bang on about, heh. Today, you are a man in form. I am, I'm on fire. Auctioneer Chris' son James is taking the helm now. At ten on this, at £10 I'm bid. Back in. £15 now, 15. Are we all done then? £18 now. At 20. You got 20. -Over at 20, you're out. At £20 in the furniture. 22. At 22, says no. At 22. Down the front at £22. Thank you, madam, thank you. Thank you. James seems pretty relieved with that result. 20 I've got, at 20 now. I'm bid and 30. At 30, got 30. -Come on, we need to get on a bit here. This is Winston Churchill, this isn't Enid Blyton. The saviour of a nation. With the box, as well. £30. 35. 38. 38, bid 38. 38. Now were getting there. -At 40. I've got 40. -We need a bit more, sir. 42, got 42. At 42. No, no, no. I think we need a little more. At £48 I'm bid. Any more? On the net at £48, the hammer's up. Churchill does Charlie proud again. Will James' six plated picnic cups prove popular? Bid 20, got 20 at £20 in the room. And two, and five, and 25. -At £30 I'm bid for this. 35, 38, 40, at £40 I'm bid. At £40 now, 42, 45. £45, 45. Still cheap for these. They're a good size, aren't they? Are we all done? At £48, I'm bid. Are we all done at 48? James needs a good result on his aubusson rug. Here we are, here we go. My bids, then. I've got 10, £15 I'm bid. -At 15 on this, 15. I'm out at £30. £30 I'm bid. -At 35. At £35 I'm bid. At 35 on this. Any more? -At £35 are you out? Serious triumph, though, 10 to 35. Lovely profit there for James. But has he done enough to win this leg? and he's looking very prosperous, if you don't mind my saying so. Charlie started this leg with £214.84. and is crowned today's winner. Well, as the winner, winner takes all. -Thank you very much, sir. See you soon, road trippers! 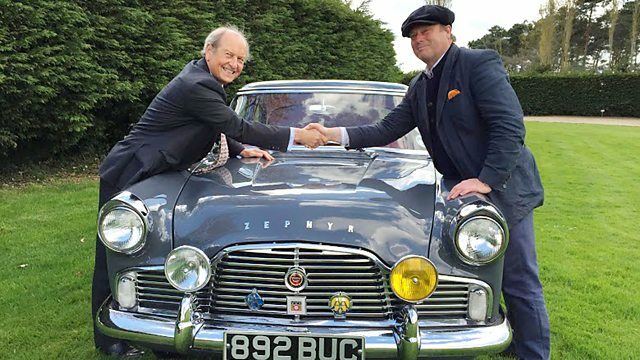 Charlie Ross and James Braxton begin in Rushden, Northamptonshire, stop off in Cambridgeshire, Bedfordshire and Buckinghamshire, before heading to an auction in St Albans, Hertfordshire.